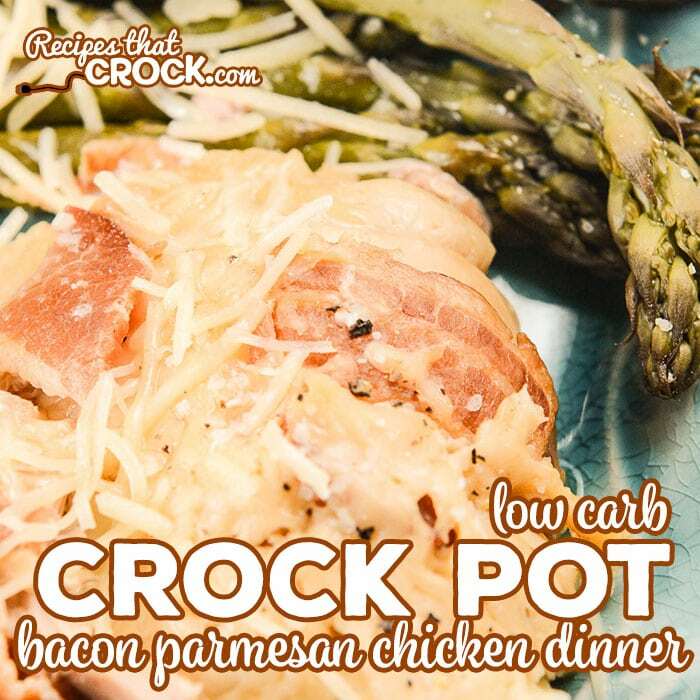 Crock Pot Bacon Parmesan Chicken Dinner (Low Carb) - Recipes That Crock! 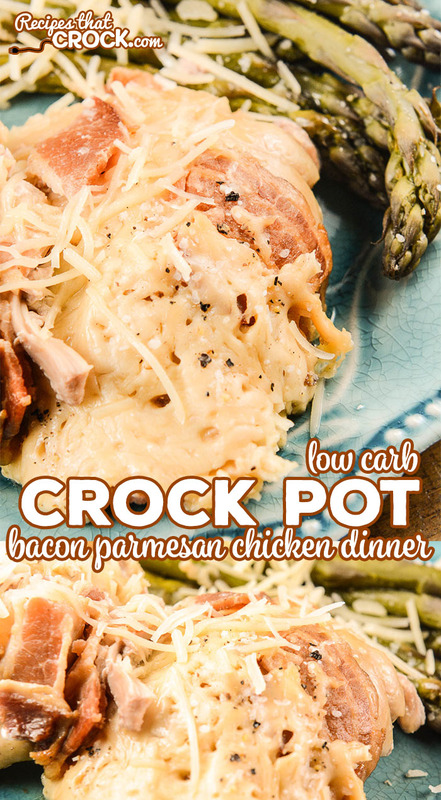 Are you looking for an easy one pot meal that is delicious and low carb? 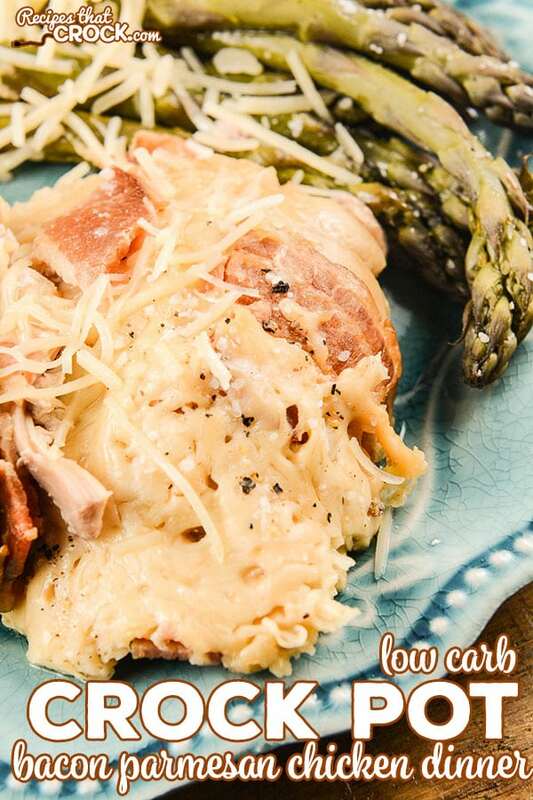 This Crock Pot Bacon Parmesan Chicken Dinner is a simple family dinner that everyone loves! 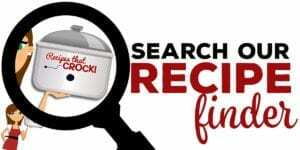 We just love it when readers and Crock Posse members (YouTube viewers) reach out to us with their tried and true recipes. As you may remember, Crock Posse member Donna G. recently shared her 3 Ingredient Slow Cooker Buffalo Chicken and we just loved it, so I was eager to try another recipe she sent me: Crock Pot Bacon Parmesan Chicken Dinner. 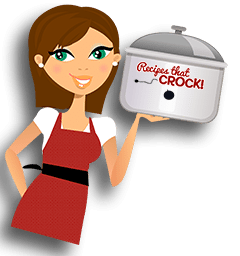 Donna is a fellow low carber and thought I might enjoy her low carb adaptation to a slow cooker recipe she had tried. I LOVED it. And, not only did I love it, but Mikey and Miss Add also loved it… so I knew I HAD to share it with all of you. 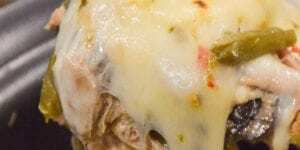 And, like all of our Crock Pot Low Carb recipes, you do NOT have to be eating low carb to love this recipe. It is just plain and simple good eating. All you need to do to make this recipe is throw your chicken in a slow cooker, season well and top with bacon, butter and parm. 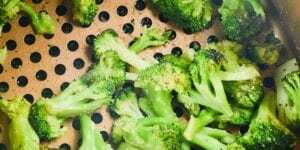 Cook on low for 3-4 hours and then toss your veggies on top (fresh asparagus or green beans) and cook until veggies are tender, usually another couple hours. I just love how versatile this recipe can be! Donna likes to switch out her veggies depending on what she wants to eat that night and that tiny switch makes a completely different meal. 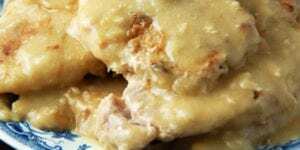 This recipe was adapted from a recipe sent to us by reader and Crock Posse members (YouTube viewer) Donna G.
You can find all our low carb recipes here. 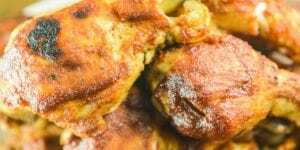 We used boneless skinless chicken thighs in our recipe, you can use the desired chicken of your choice, however, cooking time may vary. Donna used grated Parmesan cheese. We used shredded. Both turn out fantastic. As with any of our recipes, carb counts, calorie counts and nutritional information varies greatly depending on which products you choose to use when cooking this dish. Here is a post on why we do not provide such information. Season well with salt and pepper and top with bacon, butter and parm. 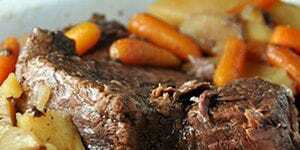 Top with fresh asparagus spears or green beans and cook for another 2 hours. Serve with additional parm for garnish.